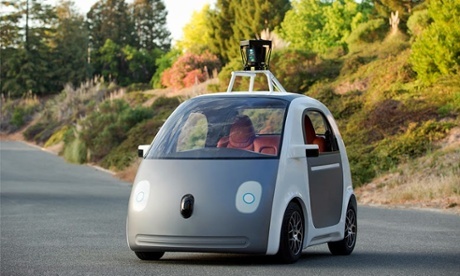 When I see these driverless cars that are restricted to 25 mph, I always imagine them updating golf cart communities. While golf carts usually can't go faster than 15 mph, the existing traffic regulations for low speed vehicles includes speeds up to 25 mph. The other idea is usually a NYC to Miami superhighway, stopping at all major metropolitan areas. 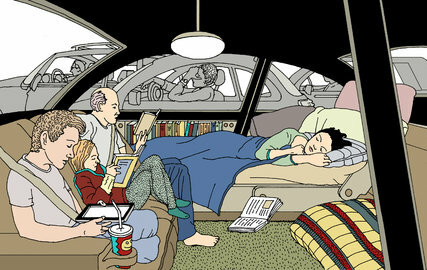 Sort of an updated modern auto train allowing people to sleep in their cars and have a vehicle for vacation. But do you think that supercommuting (sometimes defined as commutes which are 90 minutes or more one way) will be increased by driverless automobiles? The ability to have leisure, or even sleep time will allow more people to commute distances of 100 miles. I don't see the ability for much leisure and certainly not to sleep in a driverless car. Not in this lifetime, at least. But lets assume it does. I sometimes "super-commute" and indeed did so today. There isn't much I can do crammed into a car. I could watch Netflix instead of listening to podcasts. But I really couldn't get much work done. I can't sleep in a car, and do I really want to show up at work looking like I just woke up? Current driverless cars need the line on the side of the road to function, and an alert driver if things go bad. A generation will be needed for this to become so common that more full-auto mode will happen. Even if the tech works, no way I plan to get into a car with no controls like some of these predictions. Even if the tech works, no way I plan to get into a car with no controls like some of these predictions. About 2.2 million people in the United States depend on a wheelchair for day-to-day tasks and mobility. 6.5 million people use a cane, a walker, or crutches to assist with their mobility. I could see automating these mobility devices so they can follow some planned routes at 12-15 mph. They could compete with golf carts in planned low speed communities. But beyond the handicapped and retired, I don't see much use. Even the densest cities in the USA (New York and San Francsico probably won't be able to compete with the current traffic (including trucks). i am sure that San Francisco will try and develop at least one route that is 3-5 miles long (starting at Google), but that will end up being a showpiece. My commute today was 10 feet long. Sitting here in sweats doing my job. May have to go to the courthouse later, but the lesson is why try to solve the wrong problem?
. Stil waiting for that.. 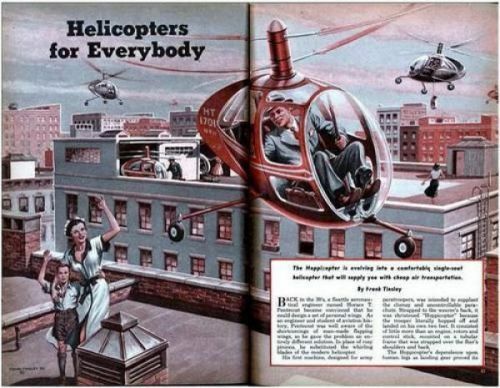 This one (circa 1950) envisions a NYC where uncontrolled numbers of helicopters compete in the air. Volvo not quite ready for prime time. Note how they say it happened because they didn't pay for the option not to run over pedestrians. Not necessarily. First they'll increase due to traffic. Consider, I live about 11 km from my office, and often take 45+ minutes to get there. More commonly it takes 30+ minutes. It's not that rare to take 60+ minutes. In rare cases, it's taken as long as 2 hours. You need the flying car. Shoot, I could use a flying car. I watched the video, but I am not sure what was supposed to happen if everything worked like the operator intended. Was the demonstration supposed to show that the car would automatically apply the brakes and stop the car before it hit the people? If so, that's different than "self-parking".